Rock on Neon's signature show, Rock on Neon Live will be playing only overlooked gems from 2017 on its live show on Saturday, January 27 from 9:00 AM to 11:00 AM EST. DELRAY BEACH, Fla. - Jan. 24, 2018 - PRLog -- Rock on Neon is an Internet radio station that has its roots in Bert Gagnon's radio station, Neon Music Radio. Neon Music Radio ceased broadcasting at the end of 2017. 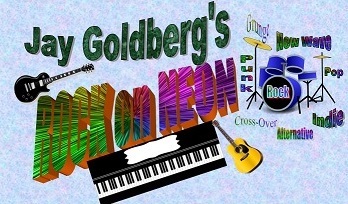 Saturday morning host of the Rock on Neon show, from Neon Music Radio, started a new station calling the station Rock on Neon and renaming the Saturday morning show Rock on Neon Live. One of the popular features on Rock on Neon (now Rock on Neon Live) is the overlooked gems/overlooked song of the week segments. Songs people need to know about. Songs radio stations worldwide need to be playing. Songs that need to be part of everyone's rock music collections. They are not songs overlooked by everyone (so some people will recognize some of the songs). They are not songs overlooked by the fans of the artists (in fact they may be fan favorites). They are not songs necessarily overlooked by Rock on Neon (past, present or future). Rock on Neon's motto comes from the song Celluloid Heroes by The Kinks, written by Ray Davies: "some that you recognize, some that you hardly even heard of." However, the overlooked gems, more often than not, for many, fall on the "hardly even heard of." On the last Saturday of January, February, March and April, the overlooked gems from 2017 will be played on Jay Goldberg's live show broadcast from 9:00 AM to 11:00 AM EST. No overlooked gem will be played on more than one of these shows. You can get to the players to listen to the station including the Saturday show from http://www.dtrconsulting.biz/rockonneon.htm. Or you can go to http://www.dtrconsulting.biz and click on the link for Rock on Neon.